Harness the power of VectorVest directly to your brokerage account. The RoboTrader implements the intelligence of VectorVest to help you make more money in the market. It harmonizes the Portfolio Genius, the AutoTimer and the BackTester to bring the awesome power of VectorVest to your portfolio. Using any trading system in VectorVest, your creation or ours, it will send alerts to you on when to buy, what to buy, and when to sell. You may execute these alerts and send the trades directly to your broker with just a few clicks of your mouse. Try RoboTrader for 30 days! 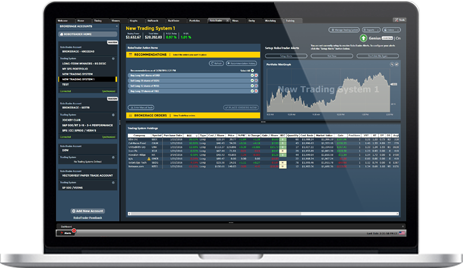 After the trial, add RoboTrader to your VectorVest subscription for $99 per month or $1,095 per year. VectorVest Derby subscribers may add RoboTrader to their account for $49 per month. What if you could trade your plan the way it was intended? Your emotions often cause you to stray from your trading plan. This powerful tool makes it much easier to manage your portfolio by keeping your emotions out of the way—improving your investment success. RoboTrader watches your portfolio around the clock, in real-time, so you don’t have to devote your time and attention. Ditch the worry and keep the profits! Whether you want to make 1 trade or 20, RoboTrader springs into action, letting you trade as many stocks as you like, in one easy, accurate transaction. No more missed opportunities! The biggest influence on the rise and fall of your portfolio is market direction. RoboTrader gives you the leverage of VectorVest’s proven timing systems, so you never miss a critical turning point. Since VectorVest lets you see the historical performance of practically any trading system you can dream up, you can invest confidently in trading systems that offer you exceptional track records with high-probability profits. Of course the current market condition is what matters, so test your trading system in real-time to evaluate its performance live before you pull the trigger. No trades are made until you give the “okay,” so you can enjoy life AND keep control.